06-26-2017: We both loved it! Ccar hire Paramaribo: vehicle was well used however didn’t cause any problems. We also drove up and down to Nieuw Nickery in one day. The car was at the hotel when we came and when we left we just handed over the keys to the Hotel staff. Very easy !! Driving in Suriname didn’t feel weird or unsafe. Trip to Pingpe: our guide Mooiboy picked us up and took us to the resort by vehicle & boat. We got wet from rain but that’s part of the game. Well organized – nice trip. Pingpe resort: great bungalow: simple and basic but lots of space, nice little verandah with hammock, good bed & mosquito-net. Resort is at a great location along river, very clean, great food, good staff, and sloths in the trees. Just a few hours of electricity per day but not an issue. Guides Mooiboy, Digicel & Killing always forthcoming & friendly. Nice little outings by boat to villages, health-care-center, waterfalls (twice), supermarket, caiman-hunting at dawn (by boat), watching & listening to jungle awakening at daybreak (this is also a trip on the boat) while sipping on a coffee. Also a 1-hour trip to the so-called ananas mountain or hill which was nice. 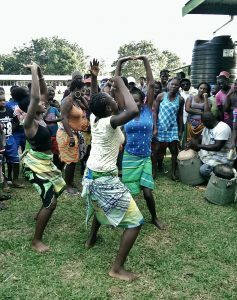 One evening ladies from neighboring village came to show us their traditional dances – very entertaining ! We also enjoyed the back-to-basic tour – I think it took us about 3 hours one-way. 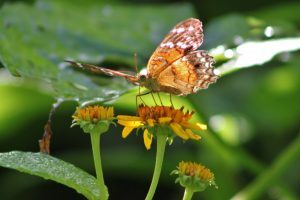 We saw quite fresh tracks of jaguars, a snake (next to Nina’s foot), a kaiman, a poison dart frog, birds & butterflies. We enjoyed the (partially adventurous) walks through the jungle, over & through streams, along fruit/vegetable plots of local marrons. Met some hunters on the way (shooting birds) which is probably illegal. The back-to-basic camp is very basic J but that’s why we did it. It rained all night and the shelter has quite a few holes/leakages. At night it was pitch-dark and the jungle noise plus noise from rain was overwhelming. Like always good & plentiful food. Guide Killing took good care of us and was able to tell us a few things about the marrons, vegetation & animals. We loved the marrons – sometimes a bit shy, mostly happy, friendly, joking, laughing, and forthcoming people. Very interesting culture ! I lived in Nigeria for 8 years and was reminded of things I had experienced there. Trip to Palumeu: we had the little plane to ourselves which off course is quite WOW (!! ), great 90 minutes flight over a sea of green with some rivers and streams crisscrossing. Palumeu: beautiful huts overlooking the river. The hut is a bit small and clairaudient (with direct neighbor) but nonetheless nice, also includes little verandah in front. Communal facilities very nice and very tasty food. Staff friendly but very reserved. Guides Julius & Jack very good. Julius always friendly and quite talkative. Jack more quiet but very knowledgeable. 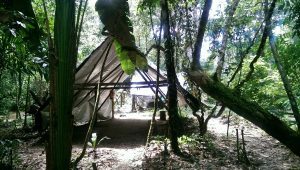 We did the usual Palumeu outings/activities which were all very nice & interesting: bow & arrow practice, fishing, floating down the river in tubes, canoeing, excursions into the jungle, visiting Amerindian village incl. school. We were some 20 tourists which was at times was a little bit difficult to handle for Julius. Nina and I (both 53) were almost the youngest – many beyond 65, some over 80. But it didn’t matter much since all were quite undertaking. The pristine nature around Palumeu is truly breathtaking. Everything, from being picked-up from the airport to being dropped back at the airport, went very smooth and without any problems. Since Palumeu & Pingpe are full-board extra expenses are very reasonable, almost negligible. Food (incl. snacks & non-alcoholic drinks) very abundant and always good. As mentioned staff and guides friendly & good. We will surely come back to you for a further trip– as U may remember we are very keen to do a 4×4 trip into Guyana to the waterfalls. Surely not in 2017 but maybe again in 2018. The kayaking with Dustin was also a really unforgettable experience we wouldn’t mind re-doing.